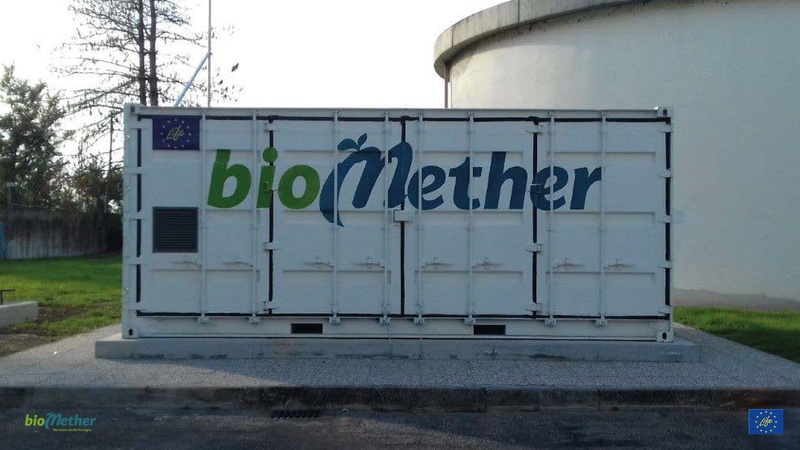 BioMethER aims at promoting the biogas/biomethane value chain in Emilia-Romagna by means of demonstration plants upgrading two types of biogas sources. Biomethane allows reducing GHG gas emissions by at least 75% compared to fossil fuels (Italian Thermotechnical Committee) and can therefore significantly contribute to meet European goals in terms of renewable energy targets. The biogas/biomethane value chain is a European strength: with 17.662 biogas plants in 2016, since 2011 biomethane production showed a 40% growth, rising from 752 GWh to 17,264 GWh in 2016 (EBA Statistical Report 2017). As for Italy, the Emilia-Romagna region currently produces about 16% of the Italian biogas and it is the second main producer after Lombardy (33%), with a total of 253 plants, of which 205 fed with agricultural/livestock/agroindustrial waste and 48 plants from wastewater treatment plants and landfill (CRPA, 2017). BioMethER demonstration plants will act as foot-in-the-door for the development of the biomethane value chain in Emilia-Romagna. Concerning biomethane from landfill biogas, at Herambiente plant in Ravenna, the upgrading plant treats biogas produced from the I,II, and III sectors of the non-hazardous urban waste landfill in Ravenna, currently in the post operational management phase. The biogas composition requires two upgrading steps in order to achieve the quality standards allowing injection in the natural gas grid: a first membrane upgrading step and a second step with PSA (Pressure Swing Adsorption), necessary to remove nitrogen from the biogas flux. The produced biomethane will be used to feed a public transport fleet of busses in Ravenna. 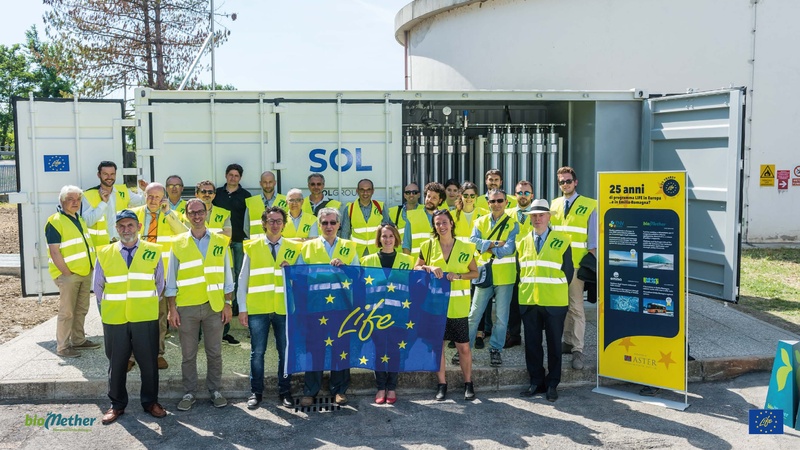 As far as it concerns biomethane from wastewater treatment plants, the wastewater treatment plant in Roncocesi (Reggio Emilia, northern Italy), managed by IRETI, a Iren group company, has two treatment lines for a total of 150.000 population equivalents. The plant collects wastewater from the western part of Reggio Emilia, Roncocesi and other nearby municipalities. From the wastewater treatment a sludge is produced, which is then sent to an anaerobic digestion plant to be processed by producing biogas. About 350.000-400.000 m3/year of the produced biogas are used to cover the thermal demand of the anaerobic digestors and the office building at the plant. About 250.000-300.000 m3/year excess biogas which were flared, are now feeding the upgrading plant to become biomethane. The upgrading plant is base on membrane separation technology and receives about 110 m3/h biogas. A dedicated fuelling station, installed at the plant, will then feed IREN natural gas fleet with the produced biomethane. BioMethER upgrading plants, designed and built by the technical partner SOL, are based on membrane technology. Main advantages offered by membrane technology are flexibility, modularity and simplicity of maintenance, and the avoided use of chemical additives. When biogas, composed by methane and carbon dioxide, is fed into the membrane separator under pressure, the undesired gas molecules are selectively removed, producing a purified stream of biomethane. However, for landfill biogas, membrane technology shows low selectivity for nitrogen molecules which are particularly abundant in this type of biogas, therefore a second upgrading step is necessary: Pressure Swing Adsorption (PSA). PSA is used to separate some gas species from a mixture of gases under pressure according to the species’ molecular characteristics. In the case of biogas, PSA technology is based on molecular sieves to capture (adsorb) methane under certain pressure conditions and allow the flux of other gaseous components. By reversing the cycle, the molecular sieves release methane and capture the undesired component. The technology is composed by several adsorbing beds working under alternate pressure conditions able to upgrade biogas to the quality of biomethane. While plants are operational, CRPA, BioMethER scientific coordinator, will monitor the biogas and the produced biomethane quality, the energy consumption and the environmental impacts of the two upgrading plants, so as to be able to characterize them and allow to shape regional support policies based on operational plants data. Additionally, BioMethER will develop guidelines for the regional government in order to support the biomethane sector, assessing the impact of biomethane production, by monitoring biomass characteristics, the updgrading process efficiency, the produced energy, the avoided CO2 emissions with a LCA approach, to develop regional criteria for the sustainability of the value chain. About BioMethER: The project, financed by the EU LIFE+ Program and co-financed by the Emilia-Romagna Region, is coordinated by ASTER, Emilia-Romagna innovation agency, and implemented by CRPA, laboratory of the regional High Technology Network, in cooperation with two of the largest multiutilities in Northern Italy Herambiente and Iren group, IRETI and IREN Rinnovabili, and SOL, upgrading technology developer. This text was provided by Stefano Valentini, Sara Picone – ASTER.